DataPlus jest dodatkowym modułem dostarczającym danych na temat korozji, spawania, wymiarów, tolerancj oraz powłok dla tysięcy materiałów metalowych i tworzyw sztucznych. Kliknij by uzyskać więcej informacji. Po kilku miesiącach używania Total Materia i po przetestowaniu wszystkich możliwości, dziękuję wam za doskonałą pracę i stałe aktualizacje. Total Materia pozwolił nam definitywnie pożegnać się z problemem doboru odpowiadających sobie materiałów w różnych krajach. Advantages of using Ultra Low Carbon (ULC) steels include good formability and a superior surface quality. Interstitial Free refers to the fact that there are no interstitial solute atoms to strain the solid iron lattice resulting soft pliable materials perfect for a range of applications such as panels in the automotive industry. The term ‘Interstitial Free steel or IF steel’ refers to the fact, that there are no interstitial solute atoms to strain the solid iron lattice, resulting in very soft steel. IF steels have interstitial free body centered cubic (bcc) ferrite matrix. These steels normally have low yield strength, high plastic strain ratio (r-value), high strain rate sensitivity and good formability. ULC (Ultra Low Carbon) steel is widely used for various applications where good formability and surface quality are required. Ultra-low carbon (ULC) Interstitial Free (IF) steels have been used as automobile panels since the latter half of the 1980s. This automobile panel material is normally produced by cold rolling and annealing after hot rolling, in which hot rolling is usually finished in the austenite region at the elevated temperature. Many research works have been conducted on the influences of both hot rolling and cold rolling technologies on product properties for ultra-low carbon IF steels (ULC IF). In the last 10 years or more, researchers have paid a great deal of attention to the warm rolling technology (also termed as ferrite rolling technology) of low carbon steels (LC) and ULC IF steels. The new technology has a series of advantages, that is, not only can the strips with better drawing properties be produced with this new technology, but can also directly produce the drawable strips for airmobile by warm rolling. It is reported that automobile strips have been produced by ferrite warm rolling in some countries. The enameling industry can also need this kind of sheet steels with excellent drawability to innovate products. However, the conventional ULC steels cannot satisfy the requirement for enameling because of too much purity and thus poor fishscale resistance. For enameling use, different alloying elements are added in the steels to form various types of inclusions and precipitates including: (1) cementite, (2) precipitates of titanium, (3) oxides and (4) boron nitride. The aim is to improve the fishscale resistance due to the presence of fine and dispersive particles and inclusions. The selection of alloying elements depends on the basic chemical composition to a large extent. For the ULC steels, the decisive elements are carbon, nitrogen, sulphur, and the useful alloying elements are titanium, rare earth metals and boron, which can improve remarkably the final properties. Steelmaking in LD → vacuum degassing in RH system → continuous casting → hot-rolled by hot strip tandem mill → pickling → cold-rolling by cold strip tandem mill → annealed by batch annealing furnace or continuous annealing furnace → skin tempering, oiling and packaging. Conventional IF steels which following the introduction of vacuum degassing technology contained carbon (C) in the range of 40 – 70 ppm (0.0040-0.0070%) and nitrogen (N) in the range of 30 -50 ppm (0.0030 – 0.0050%). Later, niobium (Nb) and/or titanium (Ti) were added to these steels to stabilize the interstitial C and N atoms. Carbon (C) and nitrogen (N) in sheet steel results in higher mechanical properties, age hardening, and deterioration of the r-value (measure of resistance to thinning and drawability). Liquid steel is processed through a vacuum degasser to reduce C and N to levels low enough that the remainder can be “stabilized” by small additions of titanium (Ti) and niobium (Nb). Ti and Nb are strong carbide/nitride formers, taking the remaining C and N out of solution in liquid iron, after which these latter two elements are no longer available to reside in the interstices between solidified iron atoms. Non-ageing IF steel has no yield point elongation, which means fluting and stretcher strains are never a problem. 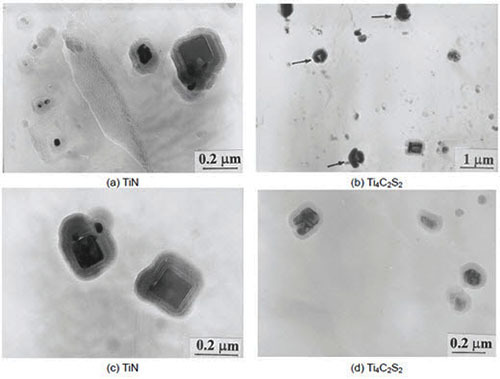 TEM examinations show that the types of precipitates are mainly TiN (or TiCN) and Ti4C2S2, and the typical examples of precipitates are shown in Figure 1. 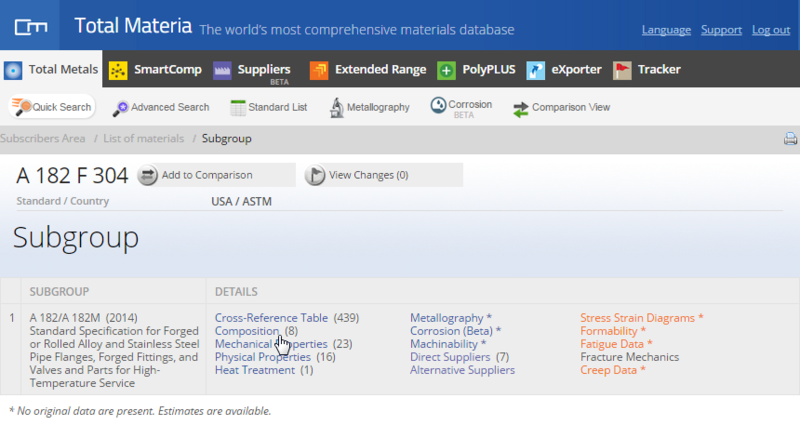 Finding chemical composition data in the Total Materia database couldn’t be easier. 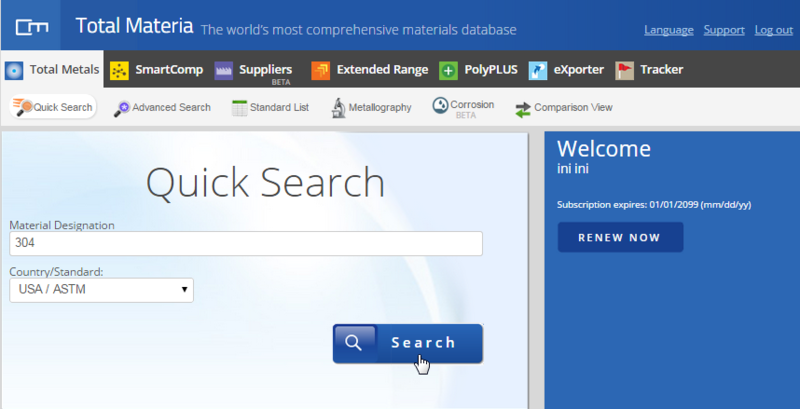 Within seconds it is possible for you to find useful chemical composition data for over 175,000 materials in the database. 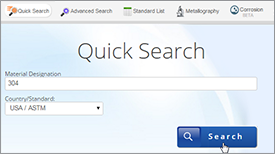 Enter the material of interest into the quick search field. 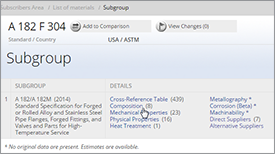 You can optionally narrow your search by specifying the country/standard of choice in the designated field and click Search. 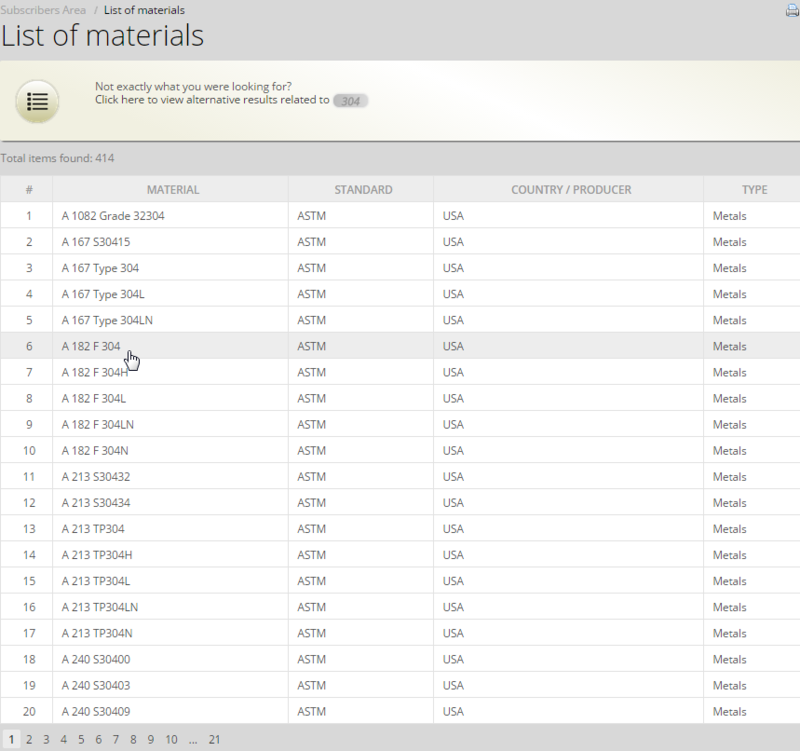 Total Materia will generate the search list for you to select the material of interest from the material list. Click on the material of interest. 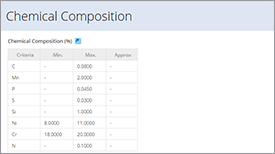 On the subgroup page, click the composition link to view chemical composition data for the selected material. 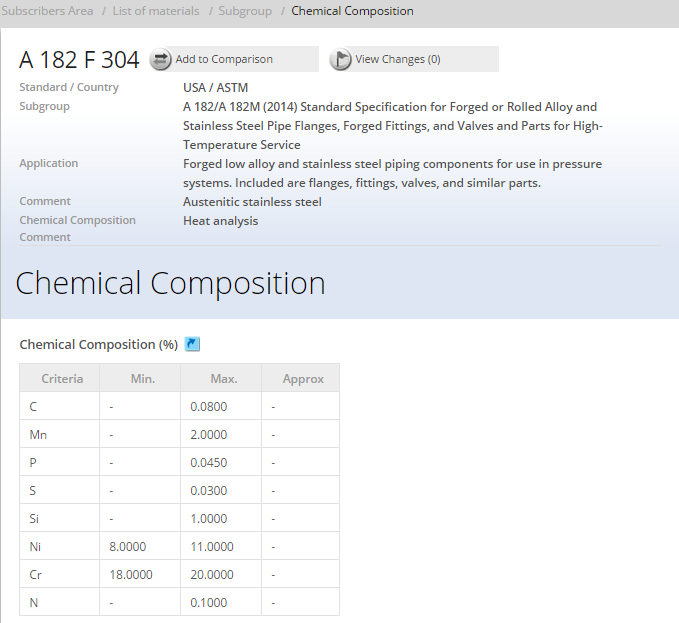 The number of chemical composition data records is displayed in brackets next to the link. 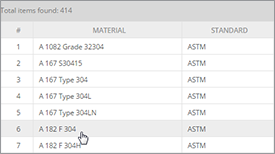 The chemical composition data will be then be displayed along with all selected material information for your reference. © 2019 Key to Metals AG. Wszelkie prawa zastrzeżone.